Before restoration can commence, the object must be examined in its gangue (covering of detritus), the way that it was found, to verify if there are any fissures or other weaknesses, as well asisolating the precise outline of the object. 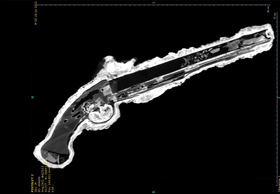 There are several techniques to do this, which are known as Non-Destructive Analysis. 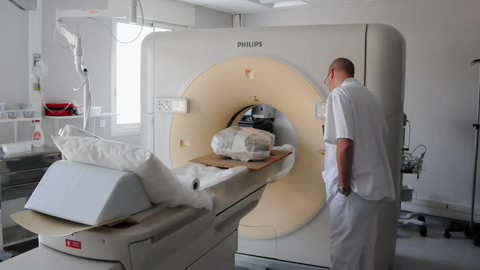 The most commonly used methods are radiography and tomography (CAT scan), which creates a cross-section of the object. Each method uses radiation to penetrate the object and provide a legible image before restorative work commences. For example, an object in five fragments was brought to us before restoration (see picture below). Radiography revealed ornamentation that was comprised of different materials. The cleaning process showed that the belt buckles, (the only ones to be found during excavation of the region)were made of an iron body inlaid with silver threads. There was a leather fastening held in place by rivets made of copper alloy. Technological advances in medical investigationhave offered us the opportunity to examine materials with greater precision. These pistols found off the coast of Hyères on the wreck of the Slava Rossii, were the subjects of these advances in technical analysis. 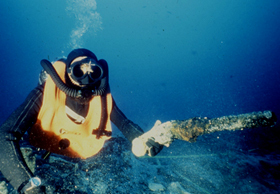 The ship was excavated by the Groupe de Recherches en Archéologie Navale, and the objects are now stored in the Département des Recherches en Archéologie Subaquatique et Sous Marine at the museum in Hyères. The results can be seen in the two slides. Similar techniques also help create moving 3D reproductions. 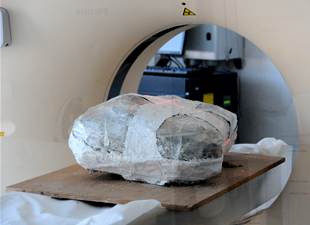 The scanning techniques used by the LC2R, assists with the study of objects that have been lifted and are still encased in its gangue of earth, detritus and corrosion products, as well as aiding with ‘micro-archaeology’, on the premises of the LC2R if the conservators’ assistance is deemed necessary. For example this set of rings has been virtually detached from its gangue. An exact position can be determined which makes it easier to ascertain the best techniques to liberate the artefact from its ‘prison’. In the case of very large objects, more penetrative gamma rays must be used, which allow us to see the different layers surrounding the object, as well as its state of preservation. 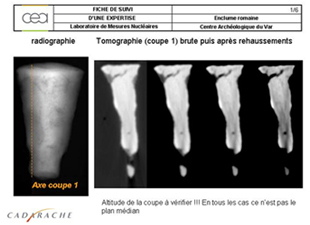 When examining this X-ray of an anvil, for example, the black zones indicate either porosity or cavities linked to the manufacturing process (this work was carried out by the CEA de Cadarache). When talking about the objects that are entrusted to us, we often say that we start with a “stone” and transform it into a “jewel”. That is to say in fact, that at first, when the objects are entrusted to us, we don’t always know what they are. Neither the archaeologists nor we can determine the function of the object when it is discovered in a shapeless gangue. The archaeologist can determine even less when, to be on the safe side, they have decided not to take the object out of its detritus; instead they have dug up a clod of earth that contains the object. Therefore we have a block of earth consolidated with strips of plaster that comprises the object, as well as any information the object can reveal. 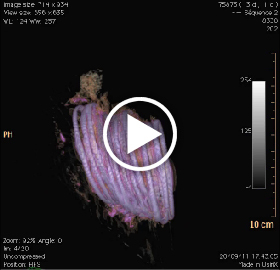 The problem is that if we do not know where we are going whatsoever, we have to resort to using a scanner; this treatment is called “non-destructive analysis”. This can either be don’t using radiography or a scanner, depending on the case. It allows us to identify the objects within the block of earth, whether they are very ornate, whether they are tools, all the kinds of things that interest archaeologists. 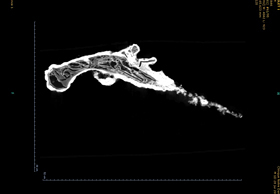 When nothing is visible with the naked eye, scanners or X-rays can reveal the form of an object which we can then uncover using micro-archaeology.